Team Integra Forums - Team Integra > General > Team Integra News > Win A Trip To The 2016 Tokyo Auto Salon On 10thCivicForum.com! CREATE AN ACCOUNT, MAKE THE REQUIRED POSTS AND WIN! Your new 10thCivicForum.com member account or existing account must have a minumum of 25 forum posts. 1st post or 1 post must be in the New Member Introduction Section make a new thread post an introduction, Let us know which vehicle you are currently driving and share a picture. 2nd post or 1 post must be in the What We Think Of The New 2016 Honda Civic Thread, in this thread answer our two questions. What you think of the new 2016 Honda Civic's design and features? and Would you consider the new 2016 Honda Civic as your next vehicle to purchase or lease, why or why not? 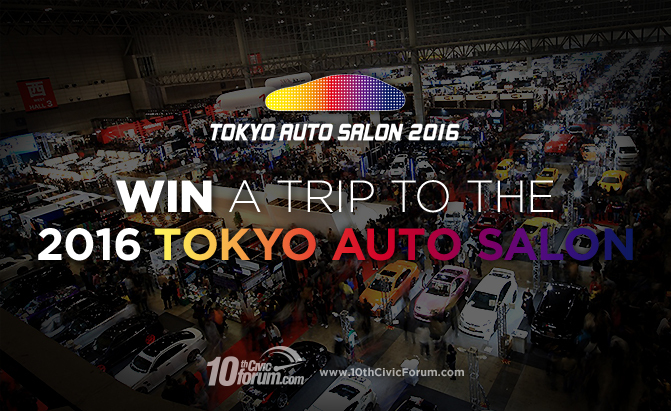 10thCivicForum.com’s Tokyo Auto Salon Trip Giveaway –“Win a trip to the 2016 Tokyo Auto Salon” which includes airfare, 3 nights’ accommodation, and US$500 in spending money (Total value of approximately $3000). Entrants are eligible to win the prize package by making a minimum of 25 posts within the forum. One (1) winner will be chosen at random and contacted by VerticalScope Inc. staff. 1. NO PURCHASE OR PAYMENT OF ANY KIND IS NECESSARY TO ENTER OR WIN THIS CONTEST. AGE/RESIDENCY RESTRICTIONS, VOID WHERE PROHIBITED. 2. PRIZE: One (1) Grand Prize winner will be randomly chosen to receive: premium airfare roundtrip to and from Tokyo, 3 nights’ accommodation, and US$500 in spending money. The selected entrant must book through the Sponsor by January 1, 2016 for travel between the dates of January 13th to January 17th, 2016. It is the winner’s responsibility to cover all other costs i.e. ground travel, meals, beverages, entertainment, resort or service fees or incidentals, etc. Use is also subject to other blackout dates and travel restrictions imposed by airlines and the hotel. Total approximate retail value of all prizes is $3,000 USD. Prizes are not transferable and no cash or prize substitution is allowed. Prize package is awarded "as is" with no warranty or guarantee, either express or implied. Any unauthorized use constitutes fraud. 3. ENTER BY INTERNET: Beginning November 30th, 2015, you may enter this contest via the Internet by logging on to 10thCivicForum.com and making a minimum of 25 forum posts. The first (1st) post must be in the “New Member Introductions Section”, where entrant will introduce themselves, state which vehicle they are currently driving and share a picture. The second (2nd) post must be in the “General Discussion Forum”, where entrant will share thoughts on the brand new 2016 Honda Civic. 4. SELECTION OF WINNER: One (1) selected entrant will be selected on or about December 23rd, 2015 by random selection of entrants who have commented in the contest post. 5. ODDS OF WINNING: Odds of winning a prize are determined by the total number of eligible entries received. 6. ELIGIBILITY: From the time of entry through the final date of prize fulfillment, each contest entrant and selected entrant must be a permanent lawful citizen and resident residing in the 50 United States or the District of Columbia, or Canada and be twenty one (21) years of age or older. VOID IN PUERTO RICO, THE U.S. VIRGIN ISLANDS, COUNTRIES OUTSIDE OF THE U.S. AND CANADA, AND ALL OTHER U.S. OR CANADIAN STATES, PROVINCES AND TERRITORIES (INCLUDING QUEBEC) WHERE PROHIBITED OR RESTRICTED BY LAW. Employees, officers, directors, agents and representatives, of the Sponsor, their respective parent companies, affiliates, subsidiaries, advertising and promotion agencies, promotion partners and any entity involved in the development, production, implementation, administration or fulfillment of this contest, and the immediate family members (e.g., spouse, mother, father, sister, brother, uncle, aunt, nephew, niece, grandparent, in-law, daughter and son, regardless of where they live) and persons living in the same household (whether or not related) of such individuals are not eligible to participate or win. Only one selected entrant per household. All decisions of the Sponsor with respect to this contest are final. The Sponsor shall have the right at any time to require proof of identity and failure to provide such proof may result in disqualification from entering into the contest and/or forfeiture of the prize. Identification and credit card will be required by the hotel at check-in to cover any expenses unrelated to the room rate and associated taxes. 7. RESTRICTIONS: The prize package consists of only those items specifically described as part of the prize. If the prize cannot be awarded due to circumstances beyond the control of the Sponsor, no substitute prize will be awarded due to the unique nature of the prize. Sponsor shall not be liable to the winner or any person claiming through winner for failure to supply the prize or any part thereof, by reason of any acts of God, any action(s), regulation(s), order(s) or request(s) by any governmental or quasi-governmental entity (whether or not the action(s), regulations(s), order(s) or request(s) prove(s) to be invalid), equipment failure, terrorist acts, threatened terrorist acts, air raid, blackout, act of public enemy, earthquake, war (declared or undeclared), fire, flood, epidemic, explosion, unusually severe weather, hurricane, embargo, labor dispute or strike (whether legal or illegal) labor or material shortage, transportation interruption of any kind, work slow-down, civil disturbance, insurrection, riot, or any other cause beyond Sponsor's control (collectively, "Force Majeure Event"). Sponsor shall not be responsible for any cancellations, delays, diversions or substitutions or any act or omissions whatsoever by the performers/events, other transportation companies or any other persons providing any of these services and accommodations to passengers including any results thereof such as changes in services or accommodations necessitated by same. 8. CONDITIONS: Entrant waives the right to assert as a cost of winning a prize any and all costs of verification and redemption or travel to redeem said prize and any liability which might arise from redeeming or seeking to redeem said prize. If the contest is not capable of running as planned by reason of any Force Majeure Event or any other cause which, in the sole opinion of Sponsor, could corrupt, compromise, undermine or otherwise affect the administration, security, fairness, integrity, viability or proper conduct of the contest, Sponsor reserves the right, in its sole and absolute discretion, to cancel, terminate, modify or suspend all or any part of the contest, and to select a winner from among all eligible entries received by Sponsor up until the time of such cancellation, termination, modification or suspension, as applicable. Sponsor reserves the right at its sole discretion to disqualify any individual that (i) tampers or attempts to tamper with the entry process or the operations of this contest in any manner, (ii) violates the Contest Terms and Conditions, or (iii) acts in an unsportsmanlike or disruptive manner, or with intent to annoy, abuse, threaten or harass any other person. CAUTION: ANY ATTEMPT BY AN ENTRANT OR ANY OTHER INDIVIDUAL TO DELIBERATELY DAMAGE OR UNDERMINE THE LEGITIMATE OPERATION OF THIS CONTEST IS A VIOLATION OF CRIMINAL AND CIVIL LAWS. SHOULD SUCH AN ATTEMPT BE MADE, SPONSOR RESERVES THE RIGHT TO SEEK CIVIL AND/OR CRIMINAL PROSECUTION AND/OR DAMAGES FROM ANY SUCH PERSON TO THE FULLEST EXTENT PERMITTED BY LAW. Any expenses and receipt and use of the prize and federal, state and local taxes and fees applicable in connection with the prize awarded are the sole responsibility of the winner. If the winner is a U.S. resident or citizen, an IRS Form 1099 will be issued in the name of the winner for the actual value of the price package received. VOID WHERE PROHIBITED. Sponsor and its officers, directors, parent companies, affiliates, subsidiaries and advertising and promotion agencies, employees, representatives and agents are not responsible for and shall not be liable for (i) any injuries, losses or damages of any kind caused by a prize resulting from acceptance, possession or usage of the prize, or (ii) printing, distribution or production errors. Sponsor or its affiliates may rescind any promotion found to contain such errors without liability at its or their sole discretion. 9. DISPUTES/CHOICE OF LAW: Except where prohibited by law, as a condition of participating in this contest, entrant agrees that any and all disputes and causes of action arising out of or connected with this contest, or any prizes awarded, shall be resolved individually, without resort to any form of class action, and exclusively by provincial or federal courts situated in the City of Toronto, Ontario, Canada. Entrant hereby waives all rights to claim, punitive, incidental or consequential damages, or any other damages, including attorneys' fees, other than entrant's actual out-of-pocket expenses. (i.e., costs associated with entering this contest), and entrant further waives all rights to have damages multiplied or increased. Ontario law governs the contest and all aspects related thereto. 10. SPONSOR: The Sponsor of this contest is VerticalScope Inc. (the owner and operator of 10thCivicForum.com), 111 Peter Street, Suite 700, Toronto, Ontario, M5V 2H1. Last edited by Administrator; 12-02-2015 at 04:52 PM.